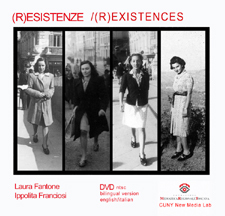 A documentary on women and resistance in Toscany, from WW2 till today. Mirella Vernizzi, Giulia Nocchi, Teresa Mattei and Carla Guelfi, Four self-described "regular women" narrate their activities, their political beliefs and struggles, from the Resistance to Fascism, to the feminist movement, to freedom of speech and contemporary global wars, connecting their everyday life with recent italian history. (DVD available in pal/ntsc with english subtitles) e-mail/contact to request a copy. New York- MARCH 4th 2005, City University of New York, Sociology brown bag lunch seminar. New York -FEBRUARY 15th 2005, City University of New York Graduate Center New Media Lab monthy meeting.